Residential « Global Market Insights, Inc. 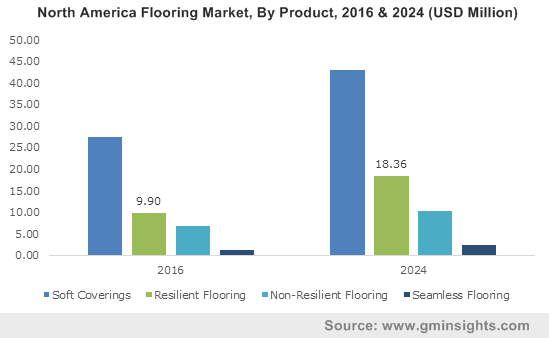 The growth prospect of flooring market is forecast to be substantially high in the ensuing years, augmented by the expanding construction ecosystem. Robust increase in construction spending across industrial, commercial, and residential sectors has significantly upscaled flooring market demand, especially across emerging nations. As per reliable estimates, global construction spending is expected to surpass USD 15 trillion by the end of 2024, which clearly portrays the lucrative opportunities for the global flooring market in the coming years. ‘Smart flooring’ has already become the latest buzzword among the infrastructural players, with workplace décor and stylish homes claimed to be the ultimate reflection of high standards of living. In response to the growing demand for flooring materials with blend of style, economic, as well as efficiency quotients, flooring market giants are coming up with variety of options that not only reflects aesthetics in design, but also stands as the test of time. Speaking of the geographical trends, the flooring market size has, of late, witnessed a rapid escalation in the emerging economies – Asia Pacific being one of the major names in the list of growth avenues. The reason behind APAC to become the preferred investment destination for flooring market giants is quite overt- its expanding construction sector. As per reliable sources, APAC is projected to account for over 46% of the global construction market by 2020. Besides, extensive developments in manufacturing sector along with growing population have further propelled flooring industry proliferation in this belt. Experts claim, China and India to be the two protruding regions that would showcase tremendous growth. In this regard, China’s National Urbanization plan for the period 2014-2020, that revolves around the mission of settling more than 100 million urban inhabitants by the end of 2020, and which would raise the urbanization rate in China to 60%, is estimated to be one of the major initiatives influencing the regional flooring market trends. This entry was posted in HVAC and Construction and tagged Commercial, Flooring Industry statistics, Flooring Market, Flooring Market Analysis, Flooring Market Research, Flooring Market Share, Flooring Market Size, Flooring Market Trends, Global Flooring Market, Industrial, Laminate Flooring Market Trends, Non-resilient Flooring, Residential, Resilient Flooring, Resilient Flooring Market Share, Seamless Flooring, Soft Coverings, Wood Flooring Market Trends.